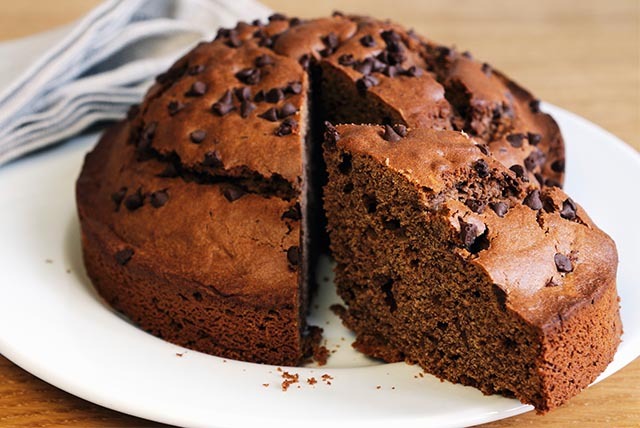 Try our easy-to-make triple chocolate cake made with chocolate cake mix, chocolate instant pudding and chocolate chips. Chocolate cake lovers - this recipe is for you! Prepare cake batter adding dry pudding mix, oil, eggs, sour cream, hot water and vanilla in medium bowl. Beat with mixer until well blended. Fold in 1/2 cup chocolate chips. Pour batter into prepared pan. Top with remaining chocolate chips. Bake 1-1/2 hours or until toothpick inserted in centre comes out clean. Cool 10 min. on wire rack. Run knife around rim of pan to loosen cake; remove rim. Cool completely. Sprinkle batter with 1/3 cup chopped nuts, such as pecans, walnuts, or peanuts before baking as directed.